B99KC V-Belt. 102" Length, Top Width 0.66 Inch, 0.35" (11/32") Thick. B99KC Lawn and Ag V-Belt. 102" Length, Top Width 0.66 Inch, 0.35" (11/32") Thick. 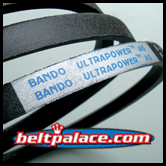 Used with "B" Pitch Pulley this type of V-Belt is highly resistant to Wear and Tear from Clutching and stretching. 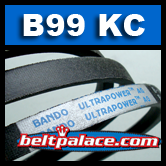 Excellent replacement for the following Lawn Mower belts: 258-102 Stens True-Blue belt, Dixie Chopper 2006B99W, Gates 69102, Goodyear 891020, Dayco L5102, Grainger 2LHG5 and more. Heavy Duty Stens "True-Blue" 258-102 belt kevlar wrapped replacement belt for Dixie Chopper 2006B99W, Gates 69102, Goodyear 891020, Dayco L5102. This Genuine Stens 258-102 measures 5/8� Inch Top Width (.625 inch) x 102� Inch Length. Engine to Deck mower belt. Fits DIXIE CHOPPER XC3300-74 and 25HP Models with 60� deck and others. A popular size mower deck belt.